Beautiful colours, the shape of the bunch mimics a champagne cork too. They look similar to what we call strawberry grapes. It's a tough one, whether to add background / detail, or leave. Not having seen it without, I cannot say wither way. but can see why you chose to put the wallpaper of vine leaves and like the way you were thinking. 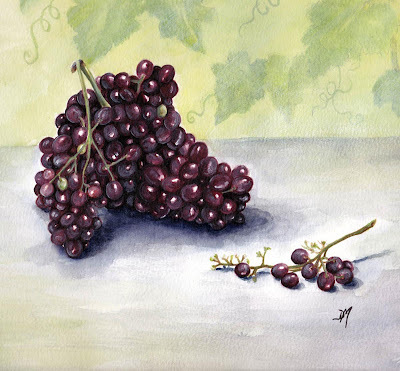 I should imagine painting those individual grapes was akin to mediation. I like the gentle hint of the background! Sometimes making mistakes actually turn out for the better! The grapes are wonderful! So rich and intense, and each one perfectly formed and reflecting the light... I also like the vine in front with some of the grapes missing, it tells a good story. Very nice work! Fabulously drwn. I also like the background.